National Book Store holds the first ever Philippine Literary Festival from October 23 to 25, 2014 at the Raffles Makati. Attend three days of book signings, discussions and panels about books and literature. Admission is FREE! It will feature international bestselling and award-winning authors Amy Tan and Chang-Rae Lee, as well as notable and award-winning authors from the Philippines. The Spotlight on Amy Tan panel will be on October 24 at 1:30 p.m. and her book signing will be on October 25 at 2 p.m. The Spotlight on Chang-Rae Lee panel and book signing will be on October 25 at 9 a.m.
Amy Tan is the woman behind The Joy Luck Club, The Kitchen God’s Wife, and The Hundred Secret Senses, which are all New York Times bestsellers and recipients of various awards all over the world. Her works have been translated into 35 languages. She has contributed articles for magazines such as The New Yorker, Harper’s Bazaar, and National Geographic. Amy Tan’s new novel The Valley of Amazement is described by the San Francisco Chronicle as “a novel that grabs your soul”. Abandoned by her mother Lucia, and uncertain of her father’s identity, Violet is one of the most celebrated courtesans in Shanghai. Her quest will set her on a path fraught with danger and complexity, and the loss of her own daughter Flora. Lucia, a willful and wild American woman who was once the proprietress of Shanghai’s most exclusive courtesan house, nurses her own secret wounds. Her search for penance and redemption will bring her to a startling reunion with Flora, and will shatter all that Violet believed she knew about her mother. Korean-American novelist Chang-Rae Lee is the author of Native Speaker, which garnered numerous awards including Ernest Hemingway Foundation/PEN Award and the American Book Award. He was hailed as one of the 20 best American writers by The New Yorker magazine for his second novel A Gesture Life. His novel Aloft earned him the Asian/Pacific American Award for Literature in the Adult Fiction category in 2006. On Such a Full Sea is Chang-Rae Lee’s latest novel, set in a dystopian future America, is described by Washington Post as “a brilliant, deeply unnerving portrait”. In a class-divided future America where urban neighborhoods function as labor colonies for elite charter villages, Fan, a female fish-tank diver, embarks on what becomes a legendary quest to find the man she loves, who mysteriously disappears. Her journey will soon become a legend to those she left behind. All events will be held at the Raffles Makati with registration starting at 8 a.m. everyday. Admission is free. 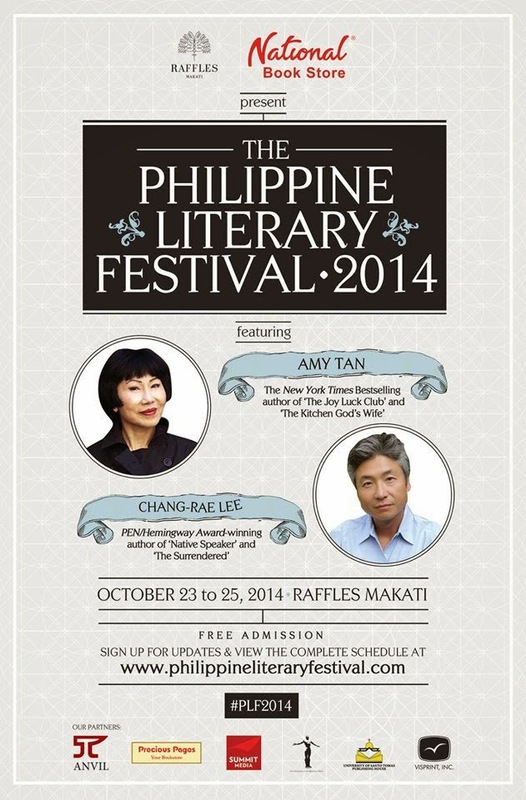 Only books purchased at the Philippine Literary Festival will be entitled to signing passes for Amy Tan and Chang-Rae Lee. View the complete schedule and get details of all events at philippineliteraryfestival.com.